Peruvian Herta Alina Alejo Santos supports youngsters in the slums of Lima. At LMU, she has obtained a first-class degree in Linguistics, while continuing to do social work here. And now, she has won a DAAD Prize. 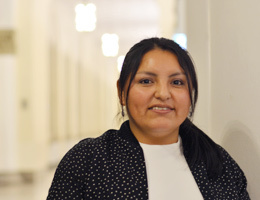 Before Herta Alina Alejo Santos came to Germany in 2008, her heart was set on a very different goal in life: She wanted to become a nun and had already been living in a convent for three years. But then she had second thoughts. “In the convent, although I was happy doing social work, I felt I needed more scope for personal development,” she says. Herta came to Munich as an au pair, learned to speak German, and ultimately matriculated at LMU to study Phonetics. In her Bachelor’s thesis, she showed that children who have just started school are already capable of making very deliberate use of intonation for particular purposes. Her academic supervisors at LMU, Dr. Conceição Cunha and Professor Jonathan Harrington, were so impressed by her research work that they nominated her for the DAAD Prize. This award honors foreign students who have an outstanding record of scholastic achievement and are actively engaged in serving the wider community. Even during her studies, Herta did not set aside her commitment to improving the lot of disadvantaged youngsters at home in Peru, and she continues to contribute to their welfare. “Alcoholism and violence directed against women are also big problems in the slums,” she says and – unlike the case in Germany – there are virtually no public agencies charged with looking after their needs, she adds. Herta is also engaged in serving her local community in Munich. Not only does she teach German at a school for children with special needs, she is also actively involved in LMU’s Peer-to-Peer Mentoring Program. – And when she has completed her studies, she wants to work with refugees.